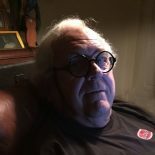 HURRAH FOR NEW WORLD PROJECTS! The Chicago River Folly. 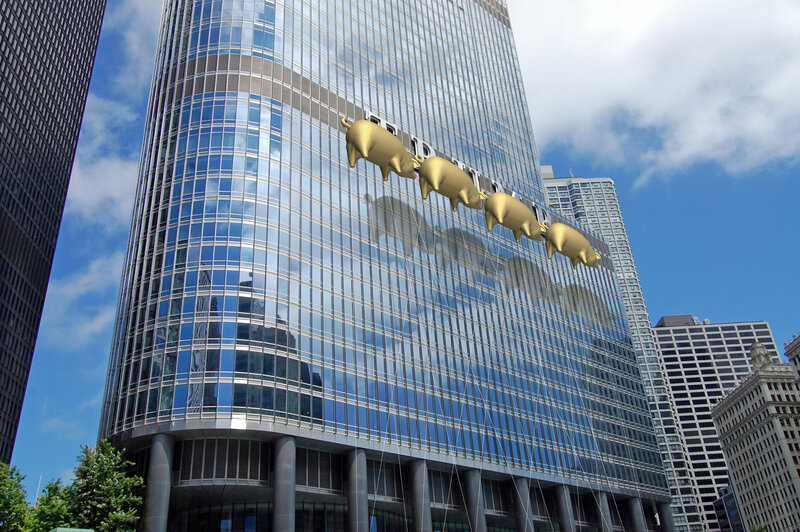 Their website Flying Pigs on Parade earned its name in 2016 when the group proposed installation of four inflated golden swine to “block the obnoxiously large Trump Tower sign along the Chicago River.” Or so it was described by Blair Kamin in the Chicago Tribune, January 14, 2019. The Chicago River Folly, an artist’s rendering. This and the following images from the Flying Pigs on Parade website. On the other hand, the proposal earned New World Projects a 2017 Gold Medal Award from the Association of Licensed Architects. 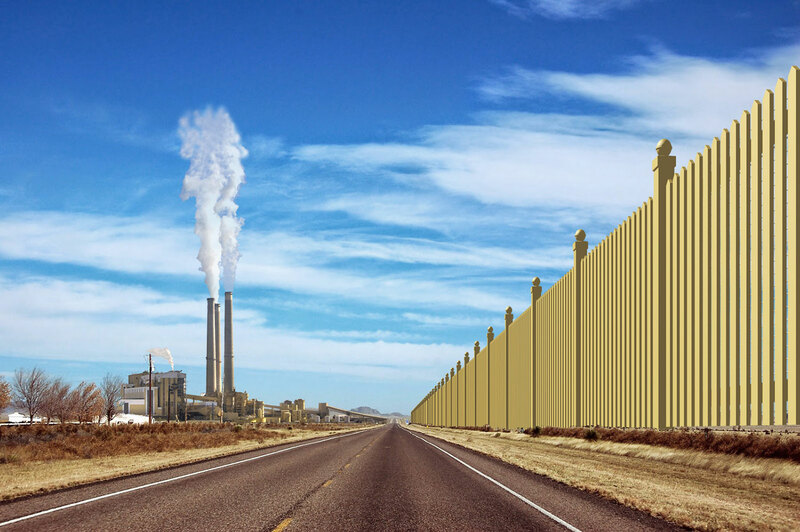 The New World Projects picket fence envisioned around Mar-a-Lago. You might recognize the guy with the putter in the background. But the young woman doesn’t look like Melania. New World Projects seeded the GoFundMe effort with a $500 contribution; this morning, the fund is at $968. The goal is $570 million, one-tenth of the $5.7 billion Trump claimed as ransom for those affected by the government shutdown. The U.S. side, all gold and shiny. 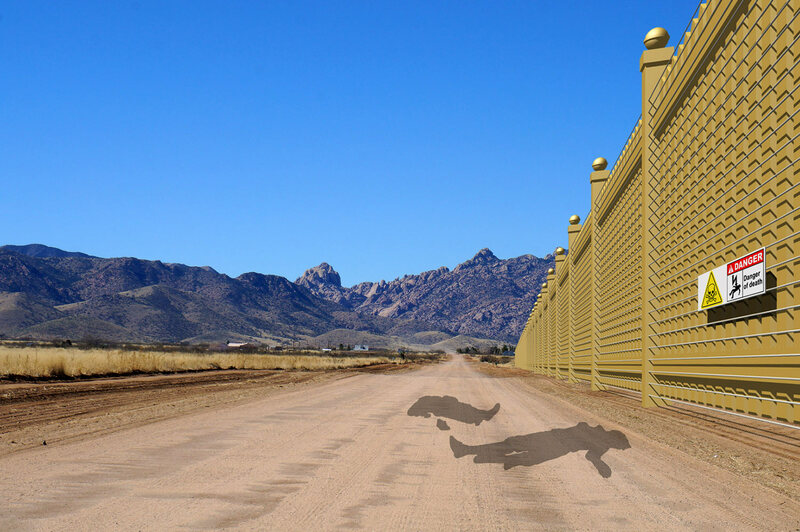 The Mexican crime-scene side. Warning signs are posted, albeit only in English. One of six new coal-fired power plants on the U.S. side. I recall Molly Ivins saying, “You can’t make this stuff up,” or words to that effect. Miss her all the time. She’s be having a field day (there’s an old saying) with the current cast of characters. 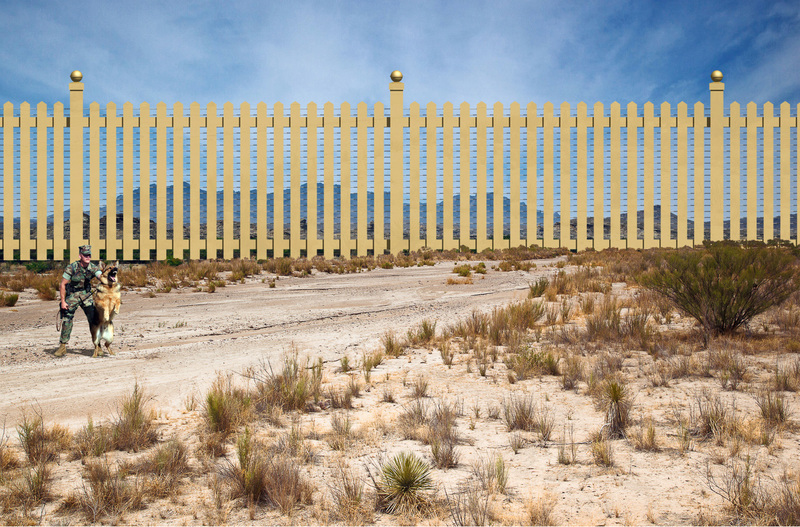 This entry was posted on February 3, 2019 by simanaitissays in And Furthermore... and tagged "Architectural Digest" article: New World Projects Mar-a-Lago picket fence, "de zeen" articles on New World Projects Mar-a-Lago picket fence, "Flying Pigs on Parade" installation blocking TRUMP name on Chicago hotel, electrified fence would depend on six new coal-fired power plants along border, New World Projects Ltd. group of Chicago architects, New World Projects: 2017 Gold Medal Award from Association of Licensed Architects, proposed gold picket fence around Mar-a-Lago (and across southwest U.S. border) New World Projects.